After the seizure Wednesday morning, Clay hasn’t gotten out of the bed…..until this morning. All day Wednesday and all day Thursday, I honestly wasn’t sure if he ever would. Dr. Gummadi wasn’t sure, either. There are just so many unknowns right now. We were not sure if he was just sleeping deeply because of exhaustion and medication from the seizure, or because of disease progression. So, you can imagine my excitement when we took this picture at around 11:00 am today. My friend, Ashley Starnes stopped by for coffee. We sat out on my balcony and talked for a while. She brought me some wonderful lavender bath products, so I could relax for a while. It was wonderful, Ashley! Thank you so much. Robin and Caleb arrived with latte!!! People who bring latte are some of my favorite people! My morning was almost made. Now, I was just hoping Clay would sit up and visit with us. Julie, our nurse, arrived, and helped me sit him up for medicine. Then, he decided he wanted to get up and brush his teeth. What? You want to get up?! And, he did. He cleaned up and changed clothes. Then he decided just to sit in his recliner, instead of getting back in bed. I was so encouraged, y’all. It seems like a little thing, but I had really prayed that he would recover from the seizure so we could have more time with him. He did. Bobby and Cindy Holt came and visited for a minute. He drank a smoothie while they talked to him. Then, James VanV arrived with his guitar. We had the sweetest time of worship and prayer. I love how music draws us close to God. He loves when we sing to Him and just thank Him from our hearts. That’s what we did. James sang some of Clay’s favorites. He laid in his chair the entire time, but he listened and worshipped. It was so good. Chenelle and Christy dropped by at the perfect time and got to enjoy the worship with us. I asked James to sing “I Am Redeemed” and he said that was much better with a piano. So, Caleb just went and got my electric piano and brought it upstairs! I want a baby grand so bad, but today was one time it was good that I don’t have one. That would have been a little more difficult to move! Caleb and Sam were able to bring it up and James played some more. Oh, it was so good to worship together in our room. The Lord was really here. Clay and I napped a little when everyone left. I actually slept last night, so I wasn’t as tired as I’ve been, but it was good to lay in the quiet for a while. We had several visitors tonight. Donuts were delivered by my childhood friend, Amanda Boulton, and her husband, Tom. Dinner was delivered by Jenna Wilcox and Diane Mohler. The Gummadi’s came to check on Clay and pray with us, Summer and Jimmy were here for a while. Pastor Lee and Carla came to see us after returning from a week away at a conference. Yesterday, Clay had visits from his Aunt Sue and cousin, Joanna. They drove in from Nashville just to see him and talk to him. He had a hard time waking up and talking, but they just sat on the bed with him and enjoyed their company. He loves y’all so much! Clay has been blessed with a life long best friend. Clay met John Green when they were around 10 years old. They’ve been close ever since. He constantly tells the kids stories about John and what a good friend he has always been. They have a unique friendship. When John walked in the room, it was the first time Clay had even tried to sit up in the bed for 2 days. I was so glad to see it. Amanda and Jason brought us a gourmet dinner. Christy, Janell and Michelle cleaned my entire house, and my friend, Jodi, came for a quick visit and afternoon coffee. She really encouraged Sam. Man, I love you people!!!! I’m tired. So, I’m not going to write much more, but I want to tell you how much I appreciate your prayers. God has heard us in the past few days. He always hears us, but I feel like He has really been near this week. My heart was so thankful when Clay wanted to get out of the bed today. His legs are still very weak and he is still tired, but I felt like God really heard us and granted us some more time with him. We love you and appreciate your prayers so much. I’ll keep updating as often as I can. I’m going to bed with a joyful heart tonight. Love y’all. Clay had another seizure this morning, and he seems to be declining rapidly. Before I tell you about it, let me back up a few days. This past Saturday night, what felt like 1,000 of my dearest friends got together to surprise me for my 40th birthday. My mom, my sister and our friends, Robin and Caleb, worked so hard to keep my from finding out, but as it seems to always happen with us, the Lord knew what was best. I was supposed to think it was a prayer meeting at our church for Clay, but I really knew that it was a party for me. I hadn’t told anyone that I knew. And, this might not be something I should admit to, but I can lie pretty good. I LOVE surprises and I’ve pulled off some epic surprises for other people. So, when I realized what they were planning, my heart was sad for them. I knew how disappointed they would be to find out. But, at 5:40 pm, Clay was laying on the floor of our shower throwing up. He was so nauseated he couldn’t even stand up. I had already gotten dressed and was ready to leave when this happened, but I had to get in the shower with him to help him. I was literally looking at him with absolutely no idea what to do. Do I tell them? Do I try to convince him to go? Sam and Grace came upstairs, expecting to find us ready to leave, and Clay was on the bed trying to go to sleep. I felt so sorry for them. You should have seen their faces. So, I decided to tell them that I knew. We told Clay that we were actually trying to get dressed for my party and he said, “Oh no. It’s your birthday?! I didn’t get you anything!” Hahaha. Y’all, he sat right up and said, “There’s no way I’m not going. Let’s go.” And, he finished getting dressed. And, I’m really glad. As bad as I knew he felt, I didn’t want to go to my party without him. We arrived 30 minutes late, but we made it. It felt like a sea of people. I haven’t counted, but it was A LOT! I felt so loved. In the midst of everything we’re going through, so many of my friends and family stopped what they were doing and came just to tell me they love me. I needed it. Thank you so much to everyone who was there! I’ll never forget that moment. And, you see that red, white and blue shirt sleeve in the far left corner….that’s Clay. He made it there with me. He didn’t really know what was going on, but he was there. While they waited for us to arrive, they really did have a prayer meeting for us. Look at all these people, praying together for Clay. Praying for our kids. Praying for me. We are so abundantly blessed. I thank God for all of you everyday. We partied and had cake. Lots of beautiful cake. It was the perfect party. Not too long, because Clay really got tired. But, long enough for me to be showered with love and gifts, and for my mom to show off a bunch of pictures of me growing up! My high school girl friends came home with me and we visited a little longer while Clay went to bed. He needed help up the stairs that night for the first time. We noticed a significant difference in his ability to walk. His legs were getting weaker. Sunday, I went to church while Clay’s friend Caleb came and sat with him. I was texting Caleb all through church to make sure he was ok. He never woke up. Some of my high school friends came to church with me – Meredith, Chenelle, Christy and Jensie (Chenelle’s daughter.) Meredith Heath was my very best friend in high school. She lived with me and my family for a year. We are like sisters. She flew in from North Carolina for the party and stayed a few days. Her primary goal was to make Clay happy, so whatever he wanted for two days, she got it. I love the selfie of us with him. He stayed upstairs all day Sunday, and although he got up for a while Sunday evening to eat, he really wasn’t out of the bed much. My cousins, Adam and Ashley, came to see him, but he couldn’t wake up. So, we visited and took pics. You know I’m good at that. Then, Todd and Drew came by to show him their baseball rings they received for winning State for Central High Baseball. Clay played in high school, so he was so excited to see this happen for them. Sam had a friend birthday party. His birthday is actually before mine, but I got to celebrate first. He is turning 18. Meredith helped me get the house ready and get food for a bunch of teenagers. Clay visited with them for just a minute, but mostly stayed upstairs. Clay was able to get up Monday for a meeting and then a few visits. He didn’t go downstairs all day, but he was awake for some visits. Cleve, Conner and Ms. Sharon brought a homemade apple pie. The Pyle’s brought the Krispie Kreme eclipse donuts! Oh my goodness! If you didn’t get one, you missed out. And a package arrived from Aunt Sue. She made us a pillow out of the t-shirt from Clay’s golf tournament. He loved it! He got a little confused when it was time to go to bed Monday night. But, he slept good. He woke up Tuesday morning nauseated and vomiting. That entire day, he was either sleeping or throwing up. It was very difficult for me to watch. He hates to be sick and he just couldn’t get any relief. We had family over for Sam’s birthday, and he tried several times to be able to visit with them, but he couldn’t stop throwing up. So, our family and friends made Sam feel special while I stayed upstairs to help Clay. Scooter and Beverly Trice, stopped by to give me a birthday gift. Oh my goodness. Look how special! They spent the week in Waco, TX, and bought me this sign at Magnolia. It is the perfect saying for how I feel right now. Clay and I have both been showered with love, and, y’all, I’m telling you, it is keeping us going. Your love and prayers have meant so much to us. And, look, Jimmy Don even signed it!!!! After the party, everyone went home and I settled in for what I thought would be a peaceful night of sleep. After vomiting all day, Clay was exhausted. At 2 am, I woke to hear him convulsing on the floor beside our bed. He was having a seizure, and he had fallen out of the bed onto the floor. I rushed to turn on the light and saw blood right away. This time was different from the first. I felt prepared. I remained calm, and turned him on his left side. I just nestled my legs behind his back so he couldn’t roll over. I held his head so he didn’t get hurt. And, I just prayed. When he started to calm down, I called Dr. Gummadi to talk me through it. He answered right away and helped me stay calm. I called Hospice and they sent the nurse. After the convulsions stopped, I called for Sam and Grace to come up and help me. They were wonderful. The nurse called the Fire Department to put Clay back in bed. She gave him some medication and stayed with me until everything had calmed down. The medicine makes him cranky and agitated, but it also makes him sleep for a long time. We lined his back with pillows and eventually got back to sleep. He slept most of the day today. The medicine puts him in a deep sleep, so he is barely conscious. Tonight at around 10 pm, I asked Sam to help me give Clay his medicine. We talked to him to wake him up, but it was very difficult. He needed to go to the bathroom, so he got up, but he was very agitated. It was hard to help him. Then he basically refused to take his medicine. He seemed confused, frustrated, and almost angry. It was not him. I know it’s the medicine, but it can still be really hard to help him when he is like this. Sam was starting to get really upset because we needed him to take the medicine. It is the seizure preventative. I begged him, I cried, I fussed, I demanded, Sam begged, Sam bargained, Sam fussed. Nothing worked. We were both at our wits end when Sam picked up the phone to call Hospice. I told him to wait. I told him to turn on my Sonos speaker and play Selah radio. The first song that came on brought such a peace to the room. I laid behind Clay and put his head in my hands and told him I was going to pray for him. Sam laid hands on Clay, too, and we prayed. He opened his eyes and said, “Ok. Where are they?” He took them. His entire demeanor changed. Sam’s eyes got really big and he looked at me like he wanted to say, “Did that just happen??! !” It did happen. The Lord heard our prayer and answered it. After that, Clay sat up and drank some water, and said he wanted donuts! Katy and Damian, thank you so much for bringing donuts. We had some glazed left. Sam popped them in the microwave and Clay ate them. He sat up and talked to us. We laughed and joked around. Grace came in and he laughed with her. It was like he was himself again, immediately. He signed some papers for me and I helped him get situated safely in the bed. Then, he quietly dosed off to sleep. Y’all, God is real. He is powerful. He hears the cries of our hearts. He sees our needs. When life is frustrating and you want to scream….turn to Him. He will answer you. He lives in Clay, so even if Clay’s mind is not right, his spirit is. The Holy Spirit is greater than our flesh. The reality of our situation is that Clay is progressing quickly. The doctors believe that the nausea and seizure is from pressure building up in his brain. It may be hard to control. So, the meds will keep him sedated unless God touches him. Please help us pray. My last blog talked about how healthy he’s been in the midst of the sickness, and while I knew these problems were likely in our future, I was hoping we had more time. Please help us pray that God will touch him and control these symptoms. I am asking God to give him strength and a sound mind. We are praying against nausea and headaches. These days have been hard, and there are more hard days ahead, but God has remained perfectly faithful. I just keep reminding myself about God’s love for me. He loves me. His love is unfailing. It never ceases. He has my life in His hands. He has my children in His hands. He knows what is best. I continue to trust Him, and I continue to be thankful for the way He answers our prayers. We love you. Goodnight. It’s been a blessing just to watch the way God has drawn people to our situation. So many of you are praying for us and believing God to do a miracle in our lives. One day I’ll have time to sit and count the number of people who have visited Clay during the past 15 months. These pics are just since last Saturday. Todd, our Hospice Chaplin, and Julie, our nurse, met with us and we were able to share our story with them. It is such a great opportunity to tell about what God has done for us, and why we’re still smiling and believing. I love the pic of them laughing above. Our house has really been filled with joy and peace. Thank God! Julie comes twice a week, and is just managing Clay’s medicine and monitoring symptoms. There is not a lot to be done for him right now. He’s doing well. Jordan and Patricia Whatley visited us with Chris and Maria Hudson. Interesting story….Patricia is the doctor who helped me at church on the Sunday night when Clay had his first real symptom. He woke up from a nap, and wasn’t able to remember what time church started or how to get there. When he told me, he already had tears in his eyes. He knew something was wrong. When we got to church, I spoke to Patricia. She helped me remain calm, but got us an appointment with one of her partners the next morning at 10:00 am. When I think of all the people God has used in our lives, I remember that moment standing in our foyer with Patricia. Thank God she was there. When she said, “No, ma’am….” I couldn’t hardly believe it. Well, it gets worse! None of them had ever had one! Poor babies. So, we fixed that problem. I gave each of them a donut, and, of course, Clay got one too. Watch this video of their first bite. Wait for Gabby’s response. It’s so cute. Y’all, while this is really cute, the sweeter (pun intended) thing about this, is that these children have prayed for Clay for 15 months. They pray for him with their parents, and they’ve come over in church and laid hands on him to pray for him. It has touched him so much to see the faith of the children in our lives. I wonder if they’ll remember that their first Krispy Kreme donut, ever, was with Mr. Clay?! Wow. I’m not sure I could have taken a worse picture, but it’s the only one we took, so I’ll have to sacrifice for the greater good! Ha. Last Saturday, my high school friends, Todd and Betsy Smith, knocked on my door with their adorable kids. We had a very nice visit over coffee. God gave me some incredible friends in my teenage years who have stayed with me all my life. It’s such a comfort to know they care about us. He woke up last Saturday to more Krispy Kreme donuts, delivered by his sweet cousin, Stacey Green. His parents came down for the visit, and my cousin, Lori, from Arkansas surprised us when she walked in the room with my grandmother. We had a party in the bedroom! Our friend, Kenny Kepper, and his wife Kara came. Kenny had a heart attack a week before they were here, and he looked wonderful! I was amazed at how well he was doing. While they were here, our friends from church, Paul and Angie Merchant, came in. Angie had a lumpectomy just a few days before this. She was recently diagnosed with breast cancer and has a long road of treatment ahead of her. We all talked about how that scripture doesn’t really make sense, until you walk through your affliction and you see how God uses it to make you more like Him. Praise God that there is purpose in our pain. Jill Wyble joined us and brought Middle School yearbooks from Istrouma Middle, when she and Clay were in 7th and 8th grade. They laughed a lot. His long term memory is perfect, so he was telling stories and they were remembering teachers and friends. Very funny to watch. Angie Robertson is an old girlfriend of Clay’s. I had only met her once, but she started writing me as soon as Clay got sick. She has kept up with our blog and written me several times to tell us how much it has ministered to her. Her children ask her to read it to them and they pray for Clay, as a family. She asked if she could see him. Now, I’ll be honest, I’ve gotten some funny looks from people when I say that Clay’s ex-girlfriend’s are visiting him. (Angie is the second one!) But, let me tell you…..I have nothing to be insecure about. This man loves me with all of his heart, and I know it. I was glad that Angie had the chance to see him and thank him. She said something really sweet to Clay that is a common theme for how many of you feel about him, and there is a lesson in it for all of us. She told him that she always remembered how he made her feel loved. He showed her how a man should treat her, and he set a standard for her future relationships. Other people have told him similar things. He has a way of making people feel special. He is genuinely interested when you talk to him. He pays attention to what people say. He always speaks. You know, like, when we’re in Wal-Mart at 10:00 pm, and he sees an old friend from Middle School 3 aisles over??!! He’s going over there to speak to them. You can bet on it. And, while there were times when I would have preferred to walk the other way, since I had no make up and I was tired – we spoke. And, now, I am so thankful for that. Because all that love and attention is getting returned to him 100 fold, at a time when he desperately needs it. I’m so proud of him. Proud to be his wife. Proud to sit beside him while people love on him and take time out of their busy lives to come tell him what he has meant to them. I’m so proud that he has lived his life for the Lord and allowed God to love people through him. God has made him a light and a testimony for many, many people to see, and I have had the best seat in the house for 15 months, as I’ve watched God minister through him. Do you ever wonder why we’re not depressed? Why we’re not scared? Why we’re smiling? This is why. Because God is ministering to people through him. There is purpose in our pain. There is a great hope in us that God has allowed affliction for a reason. Yes, it has brought us so much closer to the Lord, but it has also become a ministry. You see these pictures of all the visits, and all the people who have come through our home. And, many of you have asked me if he’s tired of it, or if I’m tired. The answer is no. I believe that God is giving Clay health in the midst of sickness because he is allowing God to speak through him. Although his short term memory is not functioning properly, he is able to testify of God’s love every time someone comes to see him. Watch this…. This is a regular occurrence in our house. Wether he’s talking to long time veterans of the faith, or people who don’t know the Lord, he tells them the same thing. “It’s Jesus, y’all!” He says that a lot. He had a visit from some friends he worked with at Hancock Bank several years ago. He loved it, and he told them all the same things he always says. Love the Lord. Jesus is everything. Nothing else matters. God is carrying the burden. When they left, he asked me to remind him what he said. He looked at me very serious and said, “Kristy, did I tell them about Jesus?” I assured him that they heard the name of Jesus that night. And, they all seemed to love Him, too. Clearly, they care deeply for Clay. It was a sweet time. We continue to be blessed with help. Jean Raggio mowed our grass, while Sam helped a little. She made his day much easier. Richard Jordan cleaned our windows this week. Man, my house is in great shape! Thank you, to so many who have helped us during this time. All these visits! So many prayers. So much love. Sooooooo much food! So much laughter. So much peace. Praise God for all of you! We had another all night prayer meeting last night. We stayed until almost 1:00 am. Clay just laid on the pew when he felt tired, but he still prayed and worshipped. I have never done this before, but I played the piano and sang for a little while. Clay loves Kari Jobe’s song, “I Am Not Alone.” Every time he hears it, he remembers that he had a vision of Jesus while he was recovering from surgery and it is triggered by this song. My sweet friends, who know how much I love pictures, and who also know how sentimental I am, captured this sweet moment. He was laying down when I went to the piano and started playing. His eyes were closed. But, when I started singing, his head popped up. I guess in shock because he listens to me play and sing at home, but never in public. He laid back down, but his hand went right up in the air in worship to the Lord. I’m probably going to take a nap, now. I love you people who love us so much! You’ll never understand how encouraged we are by your love and prayers. Thank you. Yesterday, as the rain poured down, so did my tears. As soon as I woke up, I knew it was going to be a hard day. My thoughts were consumed with the reality of what is happening. Clay is slowly getting worse. He is beginning to sleep more, and he feels tired when he’s awake. Wednesday was the first time he told me he didn’t think he could walk down the stairs because he felt weak and “fuzzy.” So, he stayed in our room all day. He had wonderful visitors, but he didn’t want to leave the room and a few times, he just laid in the bed while we visited. I had plans and things that needed to be done, but I decided just to stay right there with him. So, we sat on the bed and talked for most of the day. He loves to listen to the rain, so that’s what we did. My body is beginning to feel the effects of everything we’ve been through. I was weepy, tired, weak, and I didn’t have energy. And, I don’t feel guilty about that. The fact that I feel the grief, does not mean that I am not trusting the Lord. I am. He is still as faithful as He was on the days that I didn’t feel sad. He is still a healer. He is still my friend. He is still good. He is still love. And, as Clay and I talked, God comforted me and slowly took that sadness away. We talk a lot about what is happening. He asks me questions about what I think life will be like if he is gone. We talk about our kids and how they are handling everything. We remember the best times of our marriage. We laugh a lot. Clay tells me how much he loves me and how grateful he is for our relationship, especially in this hard time. He says, “Can you imagine going through this together if we didn’t really like each other?” Yesterday, my answer was, “It would make it harder right now, but it would make it easier to face what is ahead for me.” And that’s true. And it was cast away. Because it’s not true. God is love. He is good. He is sovereign. We don’t understand His ways, but one thing we know for sure is that His ways are perfect. And I believe with all my heart that He loves us too much to do anything but good to us. So, even though I don’t want to do this, I can trust that God sees something I don’t see and He knows something I don’t know. He has already seen our future, and He desires what is best for us. About that time, the house was quiet, and the doorbell rang. It was my cousin, Andy, who lives in Houston. He and Clay have always really liked each other. It was so good to see him standing there. He came up and we visited for a while. Then, Janet and Bill (Andy’s parents) joined us. It was perfect because we got some time to talk in the quiet. Bill recently won his battle with cancer, and while I know he would trade places with Clay if he could, we rejoice for him. God used Bill’s fight to strengthen my kids faith just before we faced this situation with Clay. The doctors only gave Bill 6 months to live, but about 3 years later, he is now completely cancer free. It was truly a miracle, and our family prayed for Bill so much. We really believed God could heal him, and He did. I watched my kids’ faith grow tremendously as we celebrated Bill’s life. God used Bill to prove to my kids (and to me) that He can do great things. So, if He chooses not to heal Clay, they don’t have to wonder if it’s because He can’t. They just have to ask God to help them trust His ways. We love you, Bill and Janet. Andy, you’re just alright…. As they are leaving, I hear Bill telling Janet she needs to move because there are a lot of people in the driveway. Ha! And, there were! We had a wonderful visit with some dear friends that the Lord placed in our lives during our time at First New Testament Church. They have moved on to different places, now, but God has preserved the friendship that we feel for one another. Clay said a few times last night that the best decision we’ve ever made was to attend FNT. God has taught us so much, and He has enriched our lives with people who love us deeply, and whom we love. We had a wonderful time of prayer and we both felt so loved by all the hugs, the delicious dinner and the huge smiles. I love these people. I’m so thankful that the body of Christ extends beyond the four walls of our churches. My parents stayed for dinner and we had a visit from Grace and Sam’s lifelong friend, Jordan Stephens. Jordan just moved away for college and she will be playing Volleyball for William Carey. She bought Clay a cap that say’s, “Carey” that he can wear to her games that she’s really hoping he can attend. I’m praying we can make it to one, Jordan. Wednesday, our house was filled with worship, and it was so wonderful. I woke Clay up for a visit with Caleb and James. James brought his guitar and the three of them sat in our bedroom for a time of prayer and worship. You could visibly see how it helped Clay. When he first woke up, he was weak, confused, and he couldn’t get his words out. After James played and they prayed, he felt fine. He has some really good men in his life. Their visit was followed by a sweet time with Bro. Wayne and Mrs. De Austin, and Mitch and Candace Mula. My dad was here most of the day, too. Candace sang while James played. Clay and I were married at Healing Place Church 18 years ago, and served there for about 8 years of our life. We made some lifelong friends during that time, including Candace and Mitch. I’ve always loved her voice (Duh! I mean who doesn’t?) and it was so great for her to sit in our room and sing worship songs with us. Bro. Wayne was my mom’s youth pastor. We go way back! They bought us a delicious dinner, but the time they spent with us was so much more valuable. Callie Richard was our Nanny for about 8 years, so she practically raised my kids. She came for dinner Wednesday night. When I was working and the kids were younger, we would meet for dinner before church on a pretty regular basis. So, that was the plan, but Clay just wasn’t able to get up for church. In fact, he didn’t even get up for dinner. So, the kids got to visit with Callie for a while. Ben, in particular, was very happy. Clay’s Aunt Mary knocked on the door and she woke him up to love on him a little. When he opened his eyes, he said, “I’m only waking up if it’s my Aunt Mary.” Ha! I think it did her some good to see that his sense of humor is fully intact. She brought fudge, so he was glad to wake up for that! She has survived cancer twice, so she understands where we are right now. They visited for a while and it was perfect because there were no distractions. She just sat by his bed and talked to him. Meet Jamie and Damien Tullier. Jamie was my best friend in 3rd and 4th grade. We were really close. We even had a journal/diary with a lock on it. I would write in it, lock it, and bring it to her. Then she would write back, lock it and bring it back to me. Little girls!!! I have wonderful memories with her. Well, then she grew up a little and she was really good friends with Clay during his college years. Then, the 3 of us were together at Healing Place in the College/Career Group. Then, we all ended up at Victory Academy when our kids started school and we’ve grown close during that time. Small world! God has blessed us so richly with wonderful people in our lives. We spend so much time talking about how much you all have meant to us. Here are a few pics from the past week. Rob Hoffpauir spent his day with me Wednesday working on our computers. I am trying to get all our family pictures organized so Clay can see them, and Rob is helping me do that. Jennifer Dougherty came and took family pictures for us, and we had a wonderful time with her. My dear friend, Robin Scherer, brought me a latte and Clay a muffin. She spent the day with me just listening to me. Dr. May is our dear friend from church who is looking after Clay’s well-being right now. He’s been such a help to us. Grace’s high school Volleyball Coach, Coach K, brought us dinner along with her precious little girl, Savannah. We had a great visit and the food was delicious! I hope you are not bored with all the pictures and the stories. This blog really helps Clay remember the things that you all have done, and the people who have visited. He remains overwhelmed by all the love. Thank you for ministering to us so much. The past week has been a sweet reminder to me of how much the Lord loves us all. Clay and I have been ministered to in so many ways. There were two very specific needs on my heart and I have been mentioning them to the Lord since we decided to enroll in Hospice. This week, the Lord met both needs. I’m only going to tell you about the first one. Yesterday, I felt like Clay and I were on one of those “fix-it” TV shows. 20 people from our church showed up at our house at 9 am and worked all day cleaning the outside of our house and repairing some things on the inside. I was bothered by the fact that the outside of the house was dirty because we’ve been having so many visitors and I want people to enjoy being here. So, God provided for my need. He lifted that burden off my shoulders. And, now, my house is more beautiful than it’s been in a long time. I wish you could all come sit on the patio with us because it is so nice, now. Clay really loves to be outside. He loves to swing and rock. We have a balcony outside of our bedroom, where he spends a lot of time, and I wanted the balcony to be clean for him to enjoy. We hung curtains to shade him and keep it cool, and added some rocking chairs so people can sit with him and visit. I love this spot, now. Just before Clay got diagnosed, I took my grandmother on a trip to Branson to visit family. After Clay’s diagnosis, I was able to look back on that trip and see some amazing things God showed me that were preparing me for the moment when our world would change. While on that trip, I bought this stained glass window. I never had time to hang it, and for over a year, it has leaned against a wall on my patio. Travis (and Angela) hung it for me yesterday. It makes me smile every time I look at it. I know it’s just a simple thing, but it reminds me of something God did to prepare me just 2 weeks before we got Clay’s diagnosis. So many people came and helped and I feel like everyone really enjoyed their day. We ate together, laughed a lot, and worked really hard. It was such a blessing. I got very emotional when they started walking in the door that morning. I just can’t believe how much people (and God) love us. Thank you so much to everyone who came. Thank you, Eric and Stacey for organizing this day. Thank you, God, for demonstrating your love to us through these dear friends. The Lord put it on my heart to invite a few of our close friends over for a time of prayer and worship Thursday night. We had been pretty busy for several days leading up to it, and I was wondering when I was going to have time to figure out the food we would need to feed about 20 people. That morning, my dear friend, Danielle Musso, snuck into my kitchen and delivered a huge tray of baked ziti. It was more than enough. She did NOT know that I needed food for that night. The Lord just put it on her heart to prepare food for 20?! Yep. That’s what He did. That afternoon, my friend Angela Kinchen called and asked if she could get me something from the grocery store because she was there and wanted to stop by with some things for us. So, she delivered salad and bread. The meal was complete. I didn’t ask, I didn’t even really pray for this, y’all. The Lord just knew the need. He told me to invite the people. Then, He provided everything we needed to make it enjoyable. I didn’t do anything. It was so amazing to watch. Then, He came and visited us as we prayed and worshipped. We were praying for healing for many in our church who are sick. But, the cry of our hearts is for God to reveal His glory to the world through our lives. We have been crying out to God to use us and make us more like Him…..that’s what He’s doing. The difficulty we walk through is making us more like Him. It’s the refiners fire. And, we are holding each other up as we walk through it together. There are different circumstances, but it’s the same work that God is accomplishing. I encourage you to surround yourself with believers. Find a really good church and make sure that you are closely knit together with people who really love God. When you are in your pit of despair, you will need them. You will need their prayers. You will need their encouragement. You will need them to remind you that God is working in your life. You will need them to help you. God will demonstrate His love to you through the believers in your life. He lives in us, so we are the demonstration of God to the world. Earlier this Summer, I was thanking God for all the miracles He was doing. He was providing every need we had, and there were so many stories I was telling people about the cool things God was doing for us in the midst of our fire. One day, I said, “I feel like the disciple whom Jesus loved.” That thought captivated my mind and I began to really ask God to speak to me about this. John is referred to in this way 4 times in the Bible. All 4 of those verses are found in the book of John. Who wrote the book of John? John. But, he never signed his epistle. He didn’t write about himself in a way that would make it obvious that he wrote it. He didn’t intend to receive any credit for it, or any recognition for that epistle. In a way, it seems like he referred to himself as the disciple whom Jesus loved, so he didn’t have to mention his own name. So, why? Why did he refer to himself this way? I believe it is because this is how he saw himself. It was his perspective. John KNEW that Jesus loved him deeply. He spent time with Jesus. The Bible says that John laid close to Jesus and would sit very near to Him as He taught the disciples. John was with Jesus at some very important moments in His life and ministry. John positioned himself to be near to Jesus. And, because John drew near, he felt the love. He knew the affection Jesus had for him. I don’t think there was pride in this reference. If John wanted attention, he would have signed the epistle and boasted of himself as he wrote it. He didn’t. Instead he almost hid himself behind that label. It’s all very simple to me, now. Have you spent time at Jesus’ feet so He can demonstrate His love to you? Have you allowed Him to shower you with His love? Have you laid on His bosom? Have you listened to His words and become convinced of His love for you? When we walk through difficulty in this life, we have a choice. We can let it destroy us. Or, we can let it bring us closer to God. We have to choose to let God receive His glory through our lives. Then, as His power is displayed, He can demonstrate His love to us, as He stands in the fire with us. If you are convinced of His love for you, you won’t ever believe that He is causing suffering in your life because He is cruel or unloving. You will stand on His promises and believe that His love for you is immeasurable. So, if He loves you so deeply, then surely, He won’t allow anything in your life that He doesn’t mean for good. I’m telling you, friends. This perspective will change your life. If you can have the same perspective John had, you will have so much peace. He loves you. He loves you. It’s so simple. He loves you with a holy, unselfish, immeasurable love. So, if He loves you, He will help you. If you cry out to Him and believe Him for the things you need, He will help you. I beg you to ask God to reveal this truth to you. Let Him help you in your need. You all have one. Don’t compare your situation to mine and Clay’s situation. You may not be facing death, but you are facing some difficulty. The world is broken and filled with heartache, so I know that you are dealing with some sort of struggle. Let God show you how your situation can bring you closer to Him. In our trials, we learn that God is real. We experience Him in a way we never have because we become desperate for Him to help us. Don’t let your trial destroy you. Don’t let it drown you in depression and anxiety. Cry out to God. He loves you. Let Him come and help you. He may not deliver you from your circumstance immediately, but He will give you peace and He will make sure you know that He is with you. No matter what you’ve done…. You can experience His love. Cry out to Him. Pray for Him to speak to you. Read the Bible. Go to church where you can experience His presence. Surround yourself with other believers to encourage you. Ask God to give you a testimony to share. Tell others about His goodness. Remind yourself of His love. You won’t be afraid. You won’t be depressed. You won’t be lonely. You won’t be mad. You won’t be sad. You won’t be swallowed up by your anguish. You will be filled with trust, love and peace. Does it still hurt? Of course. Do you still wish that it didn’t have to happen? Of course. Do you still desire another way? Of course. Do you still long for healing? Of course. But, your trust in God will overcome those emotions. And that’s when you find true joy. Joy in knowing that nothing can separate you from His love. God is amazing. His ways are too high for us to understand. But, His love is something we can feel. Let Him love you today. You all continue to be vessels for God to love on my family and I’m so thankful for it. Clay enjoys seeing people and having the chance to talk about the Lord. Our hearts are lifted because of your compassion and concern for us. Thank you. This blog has gotten too long for me to mention everyone that has come and all the food, dessert, cards and sweet things that have been done for us. But, here are the pics so you’ll know how great the past few days have been. We love you. We are so thankful for so many of you who are following our story. May God bless you so richly today. The past few days have been filled with decisions and meetings. And, while these are some of the most difficult conversations we’ll probably ever have, our home has been filled with peace and joy. Your visits, your prayers, your text messages, your cards, your gifts, your food….it has all meant so much to us. The love we feel right now is helping us continue on. And, she was. Julie came today. I’ve told you how Clay always wants to remember peoples’ names, so as soon as she said her name was Julie, he thought of a Mel Tillis song “Who’s Julie?” He said, “I’ve got it!” Hahaha. He has so much music and sports data stored in that brain! I wonder why God didn’t put the tumor there, instead of the part of his brain that controls short term memory and eye sight!? Anyway, Julie was very sweet. She answered some of our questions and helped us understand how Hospice works. After the two meetings, I feel like we have a good handle on what will happen from this point on. Honestly, it will be really nice to have in-home care and not to have to take Clay to the doctor’s office so often. The nurse will come twice a week for now. She will monitor his symptoms and help us with medicines, etc. So many of you have been concerned for us. I’m sure you are imagining our situation and considering how difficult these days have been for us. And, I would be dishonest if I tried to say that this isn’t excruciating. It is. I think so often of Jesus in Gethsemene. Through bloody sweat, He prayed for the cup to pass. He cried out to His Father in agony because He knew what He was about to endure. He knew the pain He was facing. But, out of His love for His Father, He laid down His will and agreed to drink the cup. Not my will, but yours be done. This is how we make it. This is how we keep from drowning in fear and anguish. We are surrendered to the will of God. And, we can clearly see how God has directed every step. He is in control. He has not abandoned us. He has not run away because this cancer is to difficult for Him. He is not afraid of death. He is not perplexed by our situation. He is right here. Right here in the midst of it. Helping us. Holding us. Moving us. Showing us. Loving us. Speaking to us. It’s amazing. I wrote a blog several months ago about Gethsemene. I encourage you to go read it, again. It’s one of my favorites. God comforted me so much when He showed me several truths from Jesus’ Gethsemene experience. His example is helping me through mine. He led the way. He provided our greatest example of how to surrender our will and then take up our cross. So, the papers are signed, and our relationship with Hospice has begun. And, while I type this blog, Clay is laying beside me playing “Who’s Julie” on his phone! Oh my gosh, y’all. It’s hilarious. He’s laughing and saying how crazy it is that he can remember the lyrics. I mean, who has even heard this song before??!!! He is so funny. We are grateful that his sense of humor is in tact. We laugh a lot, both at him and with him. Dr. Weinberg called me this morning to check on us. You should remember him. He was the Neuro-Surgeon that operated on Clay at MD Anderson. We really grew to love him and feel such an attachment to him. We’ve seen him several times since then, but he was not at the hospital when we were there last time. It was in that appointment that we realized we probably won’t go back to MD Anderson. I was so disappointed that we couldn’t say goodbye to him. But, he called me today and we were able to talk about Clay. He confirmed that he thinks we have made all the right decisions so far. There are many hospitals researching Glioblastoma and working to find a cure, but there are no therapies that are showing consistent results, other than the therapies Clay has already used. We would have spent his remaining days traveling a lot and he would have been very sick. That’s not what he wants. So, I was so thankful for the opportunity to thank Dr. Weinberg. He made a huge difference in our lives and I will always be grateful. He has had many good visits the past few days. Sunday morning, I woke him up for church and he told me he didn’t think he could get up. I encouraged him to try, but if he showered and still didn’t feel like he could make it, we would stay home. After he got in the shower, he never even mentioned not going. We went to church, went out to eat, came home to a visit from his cousin, sat on the front porch, went back to church for prayer, stayed and talked to our Pastors, came home to an ice cream party with some of our favorite girls, and FINALLY went to bed at around midnight. It’s amazing what he can still do. Corey, Clay’s cousin, and his wife, Stephanie, came with their kids after we got home from church. Corey sent Clay a text WAY back in the beginning of this diagnosis and it said something like, “Look what God is doing with a lump of Clay.” I LOVED it. I just couldn’t stop thinking about how cool it was that he thought of those words. 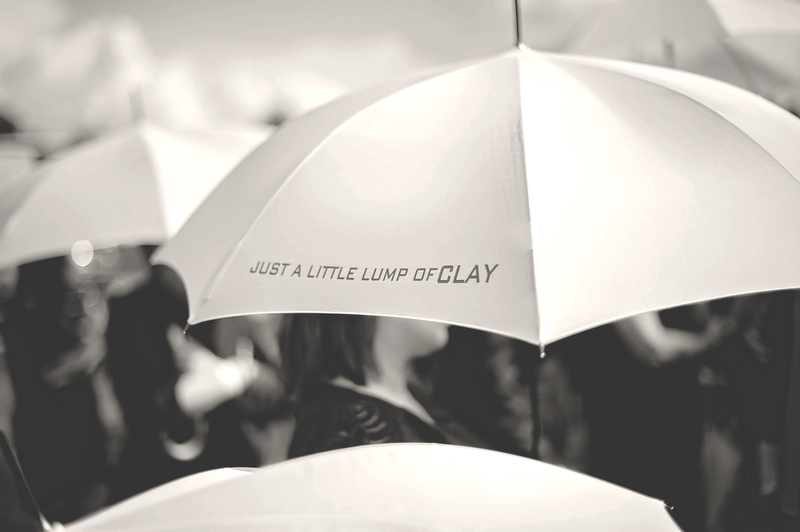 When we started the blog, I knew immediately that I wanted to use that play on words and we decided on “justalittlelumpofclay.” So, we have Corey to thank for the blog name. We had a wonderful visit, in which we mostly talked about the Lord. Corey really thanked Clay for his testimony and expressed that Clay has had a huge impact on his life. Amazing! I mentioned the ice cream party, right? It was supposed to be a girl thing, but Clay stayed the whole time! They got him Cherry Garcia and he was one happy guy. Kayla, Hanna, Emma, Mia, Me, Grace and Clay. Our dear friend, Tiffinie Burychka came to visit. We’ve both known her most of our lives. She has been a faithful friend through this time. I love you, “Spiff!” You’ve helped and encouraged us so much. Robbie and Jodi Tullier brought us a delicious homemade dinner and visited for a while. Robbie shared with Clay how he has blessed him. It’s so incredible to see men share from their hearts with each other. It’s not weak. It demonstrates tremendous strength. We started talking about how Clay loved Krispy Kreme so much and he hasn’t had any in a while. When they left, they drove to Krispy Kreme and delivered hot donuts to him! So sweet. Caleb came to visit and watched him eat the donuts. I was really impressed that he didn’t have one. They smelled amazing. I resisted, too, but later when my resolve had weakened, I went to the kitchen to get one, and opened the box to find it completely empty! Those donuts didn’t last 10 minutes in this house! Thank you, Jodi and Robbie. Love you guys. My dad spent the day with us working around the house and helping me get some things straight. He is such a help to me. Dinner was delivered by and enjoyed with some lifelong friends. Ms. Peggy, Candy, Jordan, and Brandi came to visit. Ms. Peggy went to middle school with Clay’s mom. So, this friendship goes way back! We love you, all, so much. I received a beautiful flower arrangement today that made my living room so happy. We got a special delivery from a secret angel who stocked my pantry with snacks and drinks. We are just so blessed and it makes this burden easier to carry. We are thankful for so many wonderful people in our lives. Thank you for loving us and encouraging us. Goodnight.